Because I can’t swim, I panic when water comes over my face. I’m not sure why I keep having adventures in the water but since Daniel and I married three years ago, I seem to always be getting wet. He owned a Jet Ski, so we took it to the lake. Wearing life vests, we rode double. I was thrilled but not too frightened. Then my husband had a thought—What if we turned this little bobbing thing over in the middle of the lake? Would we be able to get back on? He decided we should find out, closer to shore. We got off in the shallows, water past our waists. He climbed on and grabbed the handle bars. I tried to climb up and dumped us both off. I screamed and we splashed. We tried again. He told me to get on more quickly. I screamed; we splashed. I tried getting on more slowly. I tried not rocking the ski. I tried. I screamed. I don’t like water in my face but as long as I can get my feet under me and feel solid ground, I’m okay. I remember one time at a pool party this gullible fellow let himself be coerced into pushing me in, just for fun. Much to his dismay, I took him with me, hanging onto his neck for dear life. I very nearly strangled him. When our feet touched the bottom of the concrete pool, I un-panicked, opened my eyes, saw the fear of death on his face and let him go. I floated to the top and they hauled me out. I don’t think that poor guy ever got over it. I’ve also been at the bottom of the Illinois River in Oklahoma, the bottom of the Arkansas River in Colorado and the bottom of Lake Worth in Texas. Recently, I found myself at the bottom of the ocean off the coast of Honduras. The first three involved some sort of unintentional splash. I associate them with terror, panic and prayer. This latest was an adventure I volunteered for and calmly walked down a very long ladder to get into. I wore a helmet full of air, didn’t even get my face wet. For this type of “diving,” the helmet is connected by a long hose to an air tank on the surface. The pump is continually supplying fresh air. The helmet makes a constant gurgling sound and emits a superfluity of bubbles from a vent in the back. The diver must keep the heavy helmet in an upright position at all times or water will come in. One must not walk too fast or try to look up at the surface. But when a certain diver forgets, she need not panic but simply stand still for a few seconds while the helmet refills with air. Several friends who’ve seen the video of this adventure said they would be frightened by it or too claustrophobic. One said he could swim but could not cope with being thirty feet down. One said being enclosed in the helmet would scare her. One told me she wouldn’t want all those fishes swarming around. I thought those were the fun parts. I didn’t dwell too much on how the pressure hurt my ears or how a fellow diver had to ascend early because of an intense, sudden headache. I didn’t tell anyone about the disclaimers we signed acknowledging the possibility of aneurism and death. I only briefly mentioned how the seventy-eight-degree water felt like ice to my ninety-eight-degree body. The video editor took out all the scenes wherein I worked my jaw to relieve the pressure on my ears and the part when the current nearly knocked me off my feet. They didn’t catch my eyes bulging when my helmet tipped and sea water came in up to my nose. The pictures don’t show the discomfort of the seventy-pound helmet on my shoulders or the annoying gurgle that masked the soft nature sounds of fish nibbling on coral. What I remember is my excitement at walking on the ocean floor, seeing live coral, anemones and turquoise water peculiar to the Caribbean Sea. Vivid in my mind is actually seeing and touching all the bright and curious little fishes, a sea urchin attaching itself to my palm and the feel of soft suckers on the underbody of a starfish. I was thrilled at the possibility as the scuba diver tried to herd a tiny spotted ray into my grasp, disappointed when he escaped. I’m not sure I could have enjoyed all that while wearing a mask and flippers and a scuba tank. There’s simply nothing like having one’s feet on solid ground. 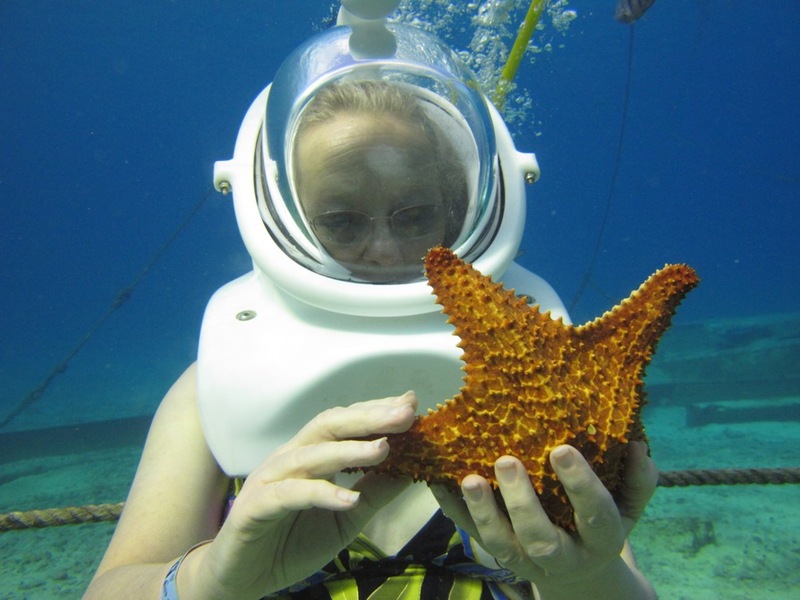 This entry was posted in Short Takes on Life and tagged Caribbean Sea, helmet diving, Honduras, Jet Ski, scuba diver, sea urchin, starfish, swimming, water sports. Bookmark the permalink. It all sounds so very adverturous, but one I am pretty sure I will never experience. I can relate, too vividly, to being thrown into a pool and clinging to the neck of the boy responsible. This is where the parallel of our water adventures part. Great blog though. You are right, photography just doesn’t capture the entire venture but your imagery does. Thanks for interacting, Carole. Comments always appreciated.